3. _____ makes me laugh. 4. Did you know _____? 5. I looked more closely and I saw _____. 6. I'm so glad _____. Mineare up. Really eclectic answers this time. Just let my mind go walkabout! It's been too long, since I've linked up with you. Nonetheless, I am happy to get to participate today and hope I can stay better on track with my Friday memes. Mine are up! 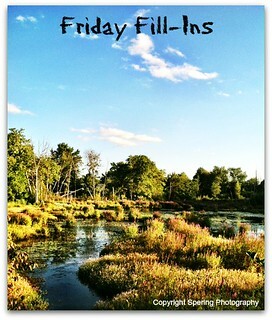 Feel free to hop over to read my fill-ins at Friday Fun with Fill-Ins! Love the new Linky tool!! Love doing this every week, thanks!